I was taught this amazing recipe while living with a wonderful family in a small village in Iran, intensively studying Persian vegetarian cooking for 4 weeks and learning Farsi for Foreigners. Twice a day we cooked and feasted on traditional dishes. We snacked on exotic fresh and dried fruits throughout the slow, enjoyable days. Enchanting traditional folk music drifted now and then in the air. The sun set into the intense jagged lines of the mountains each evening. I was visiting some friends recently on a long weekend trip to the south. On our search for a unique and tasty lunch, we happened upon a small-street Persian restaurant, remarkably called, Persian Restaurant. (Ja, ja — literal and obvious naming conventions in Germany.) This eggplant dish jumped out at me from the vegetarian section of the menu. I asked the waitress to describe it, which she did. I anxiously placed my order and continued sipping my black tea in hungry, curious anticipation. The meal was fantastic. 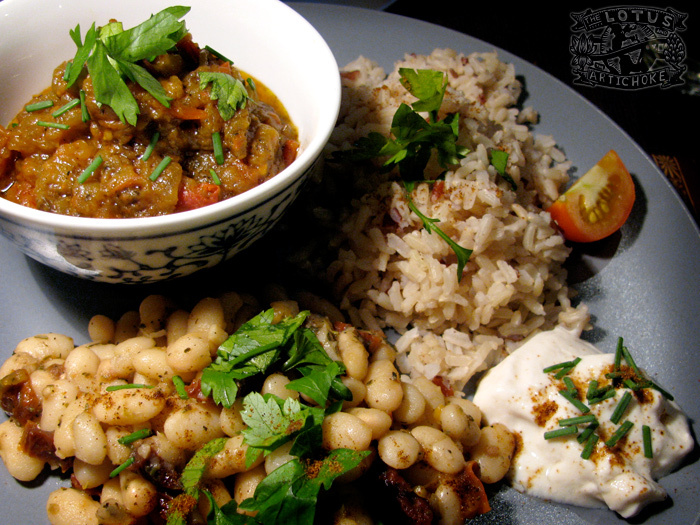 Aubergine-arama, piles of pita bread, heaps of parsley, saffron rice, and that delicious tea! So, I didn’t learn any Farsi, but I did ask the waitress — and then the cook (her mother) — for details on the recipe. Standing on the brink of the kitchen, my first thought was She must be leaving out the secret spices to guard the family recipe! But no, she insisted that the dish is only seasoned with turmeric, salt, and pepper. It wasn’t until yesterday that I discovered she was telling the truth. Mirza Ghasemi reminds me very much of North Indian Bengan Bhartha; just with fewer spices and more tomato. Look at a world map and you’ll understand it’s no geographical coincidence that the two cultures would share similar dishes! Poke several holes in whole eggplant with a fork, coat lightly with oil, roast in oven about 35-45 min. Eggplant will become soft and collapse when done. Allow to cool, peel, discard burnt skin, transfer insides to bowl, chop, mash well. In a large pot heat oil on medium. Add garlic, pepper, chili. Fry 2-3 min, stirring constantly. Add mashed eggplant, turmeric. Fry, stirring regularly, about 5 min. Add chopped tomato, continue to mix, fry until well-cooked, 7-10 min. Add water as needed for desired consistency. Add salt, reduce to low heat. Cook partially covered, stirring occasionally, 5 min. Garnish with fresh parsley or mint. Serve with soy yogurt, and rice or flat bread. Eggless egg twist: Mirza Ghasemi is often made with eggs. Keep things vegan and retain the classic taste by adding 4 oz / 115 g crumbled tofu, 1/4 tspn black salt (kala namak from an Asian/Indian spice shop) to roasted eggplant before frying. Vedic style: replace the garlic with 1/4 tspn asafoetida (hing), 1/2 tspn mustard seeds, 1/2 tspn ground coriander, 1/2 tspn ground cumin. Congratulations, you’ve crossed the border and now have Bengan Bhartha! This entry was posted in Persian and tagged aubergine, eggplant, iran, mirza ghasemi, persian, recipe, vegan. Bookmark the permalink. It’s times like this that my eggplant sensitivity really bums me out. I love those purple veggies, but they don’t love me! I’ll have to see how this works out with zucchini instead. Hannah, that is a bummer with the eggplant sensitivity. I wonder if Asian eggplants or salting them (to remove some of the bitter oils) makes a difference. Is it an allergy or irritation? Years ago I used to have a mild allergic reaction to eggplant, and similarly to pineapple– weird fuzzy sensation or numbness in my mouth. I’ll be curious to hear how the recipe works out with zucchini instead, please let me know. I also love this sort of recipe a lot! I have made similar recipes like this one before & loved it too! :) I am so going to make it! Sophie, that’s great that the zucchini lasagna is such a popular hit! I’m always especially pleased when I hear that non-veg eaters also enjoy the vegan recipes. Let me know how it goes with the persian eggplant. Several people have made it so far and I’ve heard great things! I heart this recipe! I think it would be ok to even leave the skin on. Extra fiber! It certainly is possible to do it with the skin still on, it just tends to put the flavor in a more bitter direction. I’ve experimented with both. Glad you like the recipe! It’s a tasty one, for sure! Good eggplant is great! I was so delighted to find a Vedic version of Mirza Ghasemi that I subscribed to your site. I cook Vedic vegetarian Iranian cuisine for my husband and have yet to find recipes on the web that are both Vedic and Iranian. I am so grateful! Looking forward to more recipes and advice from you. I had about 10 min to add an eggplant side dish to our impromptu Persian-inspired dinner (forgot about it and cleaned up while other things were cooking instead of working with the eggplant). I didn’t want to make my usual eggplant with Italian or Asian seasoning and found this recipe. I read the ingredient list, yes, I had everything needed! I didn’t have time to read the instructions or I may have stopped. Instead I peeled and cubed the eggplant, tossed olive oil and eggplant in a cast iron pan alone for a few minutes, prepped the garlic & tomatoes, then dumped them in with the other ingredients as quickly as I could gather them up. I used a spatula to turn the eggplant occasionally to cook evenly, keep it from becoming mush, and mix the ingredients. I only had dried mint, so I crumbled that in the last 2 min of cooking. We loved it! The pepper added a nice kick. Thank you for giving me another option for eggplant! I made this simple dish yesterday and I loved it! Thank you for the recipe.